Winter often brings the hustle of the holiday season followed by the bustle of starting off a new year. But for homeowners, it can also bring the on-going commotion of a home insurance claim. If your homeowners insurance company is disputing a wintertime claim, contact the skilled Orlando insurance lawyers with the Law Offices of Michael B. Brehne, P.A. Mother Nature doesn’t go on vacation during the winter, even in Florida. Weather-related causes for home insurance claims lead the number of filings most years, with wind and hail affecting the Orlando, FL area along with occasional frozen pipes and leaking plumbing. Our mild winters aren’t without a downside, especially as spring approaches and the occasional severe thunderstorm bring heavy rain, high wind, and hail. Most hail damage to a home happens to the roof as shingles are knocked loose or broken by the hailstones. It’s important to get a home insurance claim filed as soon as you find hail damage and begin repairing the roof. Left unrepaired, loose or missing shingles or roof tiles won’t stop rain or other water from entering the home and causing water damage. Yes, frozen pipes do happen in central Florida. Though they’re rare, the average insurance claim due to frozen pipes is more than $7,000 because of the ensuing water damage. Homeowners insurance usually covers the damage, unless the insurance company decides negligence on your part caused the frozen pipes. While northern climates brace for heavy snow, subzero temperatures, and wind with winter storms, our winter storms generally bring high winds. Unfortunately it doesn’t take a full blown windstorm but just a few windy afternoon hours to cause wind damage to homes. Tree limbs, branches, or anything in the yard not secured to the ground can break siding, windows, or crash through the roof on a windy day. If you hosted extra guests over the holidays, the added use of the home’s plumbing could exacerbate an existing water leak into an insurance claim. Or, maybe water leaks developed from normal plumbing use. Whatever the reason or time of year, water leaks are pesky and time consuming, especially if you wind up needing insurance dispute lawyers to take on the insurance company. Nobody plans for home damage during the winter, but there are ways to prevent the most common ways. The insurance company will look for negligence as a reason to not pay out any claim filed, so taking steps to prevent any damage is in your best interest. 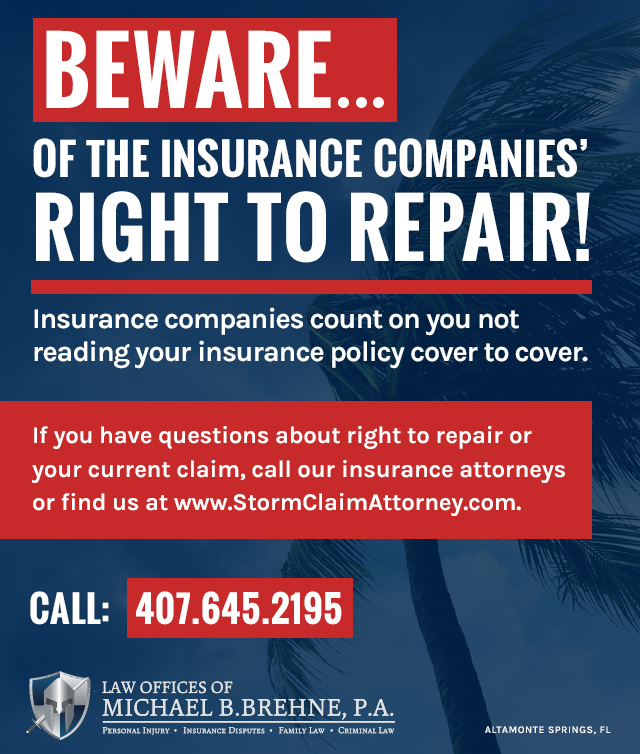 But if your insurance company says you could have prevented winter home damage, contact an insurance dispute attorney in Orlando, FL with the Law Offices of Michael B. Brehne, P.A. Our firm has years of experience fighting insurance companies and getting homeowners the monies to repair they deserve. It’s better to be proactive with leaky plumbing than reactive. Repairing a leak as soon as it’s found will be a lot cheaper in the short- and long-term than paying for an emergency repair and water damage down the road. Pipe sleeves or heat tape is usually sufficient for insulating pipes in Florida as we don’t experience long-term freezing temperatures in the winter. Any pipes in unheated spaces such as crawl spaces, attics, and/or garages should be insulated. The stately trees around your home may seem to grow slowly until a wind storm brings a limb or several branches crashing into your home. Prevent home damage in the winter by scheduling a trimming or pruning appointment with a local tree arborist. They’ll evaluate the trees around your home and trim back branches and limbs to prevent high wind damage. Preparation is key to avoiding the headaches and stress related to dealing with a home insurance claim in the winter. Replace missing, torn, broken, or otherwise damaged shingles as soon as they’re found. Keep the gutters clean and make any necessary repairs so any rain or water during the winter can drain properly. A plumber can look over your home’s plumbing system before you leave on an extended winter vacation or have a house full of guests and let you know of issues and repairs to fix the issues. If a branch or entire tree appears to be too close to the house or appears to be dying, have a professional tree service company inspect and remove it if necessary. It’s better to have a tree removed than have it removed while also repairing a damaged home. For many years, most homeowners insurance companies paid policyholders money for losses experienced in a covered event. But many companies are now using a new provision, right to repair, and many homeowners aren’t aware of the change. Right to repair means the insurance company can – and will – hire a contractor of their choosing to repair your home. This contractor will make any repairs with the insurance company’s best interest in mind, not yours. Homeowners are then left with little recourse against the contractor for shoddy repairs or even a lack of repairs because the insurance company hired them, not the homeowner. A good way to avoid this situation is to thoroughly read your homeowners insurance policy. If the policy has a right to repair provision, consider changing insurance companies. The insurance dispute lawyers with the Law Offices of Michael B. Brehne, P.A. are available to help you handle all right to repair situations and homeowners insurance claims. Denied Claim? Call An Insurance Claims Attorney! Filing a homeowners insurance claim any time of year can be a stressful process, but the busy winter season can add even more stress. Then, if the insurance company denies the claim, you may be left scrambling to find monies to repair the damage, even if you did nothing wrong. An insurance claims attorney with the Law Offices of Michael B. Brehne, P.A. will take on the insurance company and fight for the money you’re entitled to after home damage in the winter. Contact our firm today to discuss your case.